Achroia grisella also known as the Lesser Wax Worm. These are smaller than the regular wax worm, but are heartier and easier to culture. Great for feeding to smaller reptiles, or for feeding smaller portions to larger reptiles. The moths and worms can be fed. Each culture comes with worms, moths and bedding in a culture cup that is their home. 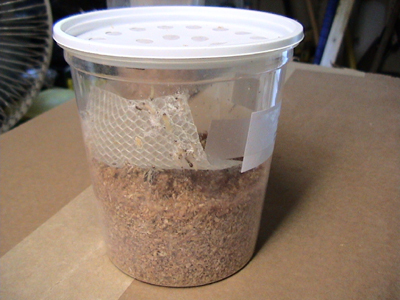 You do not have to transfer the worms or moths to another container just use them as you need them. Each culture contains an established culture that has been active for at least one month. You can keep the culture cycling for a long time if you also get our Lesser Wax Worm bedding, that we offer, to feed them once the bedding in the culture is used. You can also make your own Lesser Wax Worm bedding. It will take a couple of cycles for the bedding to get used up. Add more bedding when the bedding in the container starts to look like little balls of dust. Just add bedding and allow the culture to grow inside of the container. Then split it to make two cultures and repeat. Keep the Live Lesser Wax Worm culture in a warm place so that they keep breeding and cycling. If you wish to feed off moths or the small Lesser Wax Worms just put in the refrigerator for a few minutes and remove what you want and then let them warm up again. This is a great addition to a varied diet for many reptiles. There aren't any foreign bugs in our cultures and no grain moths. Each culture price includes shipping via USPS Priority Mail. This video is of one of our many mother cultures that we use to breed our Lesser Wax Moths.